Failed tires on your trailer? Changing tires on your trailer to prevent a tire failure? First, this article is about travel trailers – RV’s – that have ST type tires. Other kinds of trailers or RV trailers with other types of tires are not addressed here. PLEASE: Read the entire article. If you jump down to the table, you’ll miss some very important information – some of which will prevent heartache on your part. It may be a bit tedious. I do have to cover a lot of situations. But your patience will be rewarded. You will need to get some info – and they indicate on that page what you should get. The more complete the info you provide, the more useful the information will be. You should weigh your trailer. This applies whether you had a tire failure or not. The best way is load up the vehicle with as much stuff as you’ll ever think of hauling. 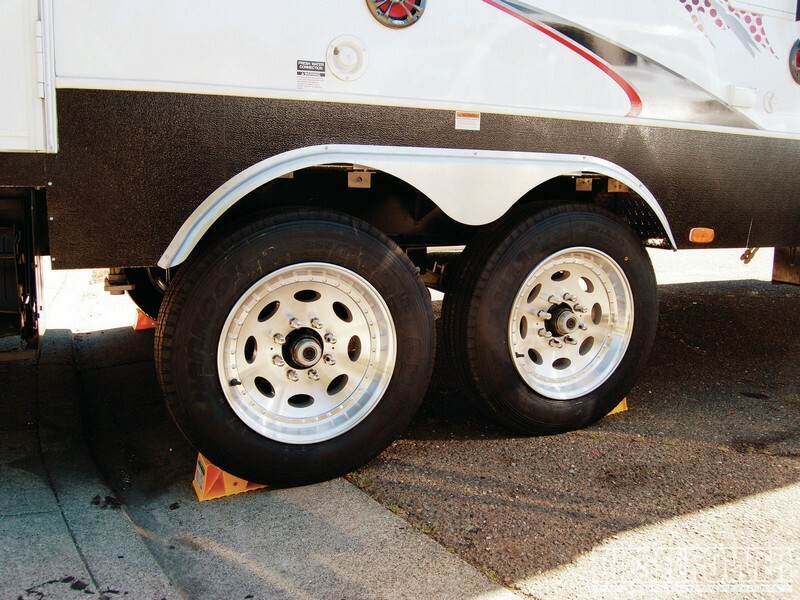 The purpose of weighing the trailer is to make sure you don’t have overloaded tires. It only takes ONE overloaded tire to cause a failure, so the more detailed and accurate you can be, the better. You may want to read the entire RMA book, as it is chock full of info you will find useful. OK, done both of those things? – filed a report and weighed your trailer? What do you do about the future? Again, we are talking about ST type tires – the tire size starts with the letters “ST”. If you are using another type of tire, some of what appears below may not exactly fit, but it is directionally what to do. Did the weighing of the trailer reveal any overload? If yes, then that has to be addressed first. Figure out what tire size and Load Range you are going to need to carry the MAX load you got. Are any of the individual tire loads more than 15% larger than the average? If so, you need to rearrange things in the trailer to get below that value – not only for your tires, but for stability during towing. If not, adjust the max to that 15% value. If you didn’t weigh the trailer at all, shame on you. You’re taking a risk that is easily remedied. But if you have to, then use the GAWR’s. 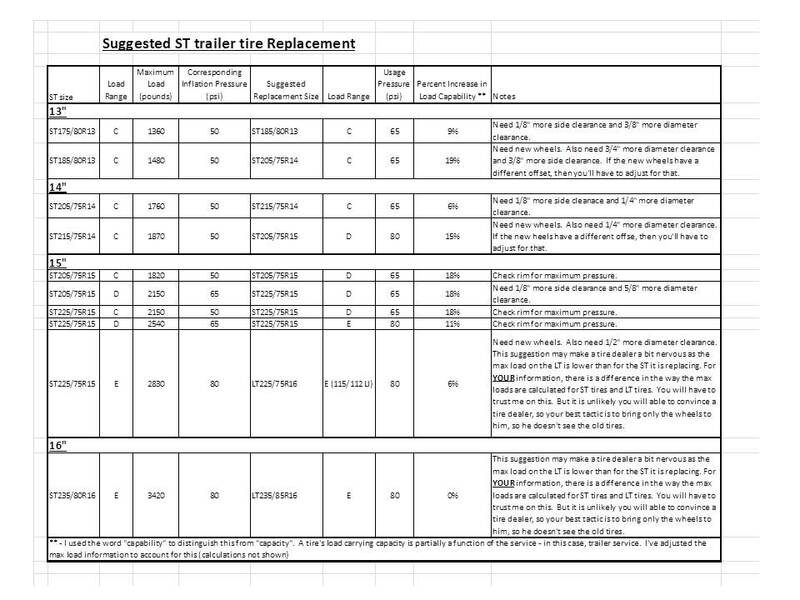 To the right are my recommendations for replacing ST tires. Click on it and an Excel spreadsheet will open in a new window. Please note: This is based on my knowledge of tires and how they work. I have not actually done any of these - nor do I have enough information to say that this works every time. It is, however, the best info you are likely to find. And for those who requested it, to the right are the ST tire dimensions tables - including rim widths.. Enjoy.